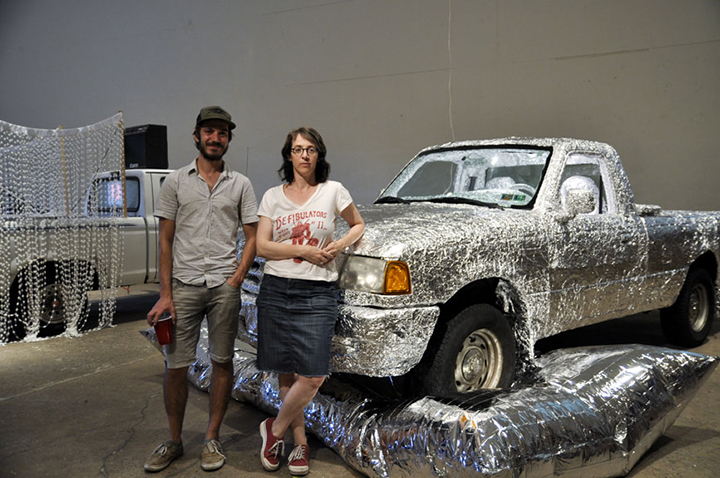 The Silver Era, 2014, A collaboration with Matt Giel, 2001 Ford Ranger, 750 square feet of aluminum foil, emergency space blankets, hair dryer, and LED lights. This humble monument to reflective public art was created for the semi-annual Philadelphia Pickup Truck Expo. The interior and exterior of the 2001 Ford Ranger is shielded in foil. Beneath the truck is a cloud shaped balloon made from inflated space blankets. Built with inexpensive materials, we create a dichotomy between high and low brow: referencing high art steel monuments with a college-level prank. Considering aesthetics while sitting uncomfortably with current issues: government surveillance tactics, corporate data mining, reports of natural disasters, and immigration border controls.